Note: The ArtCarved page does not show the Seahawk or Noblesse. Please contact their customer service department at 1-877-Balfour (225-3687). 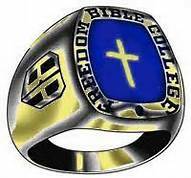 They will ask for School Information – Be sure to specify Freedom Bible College, Arkansas. Feel free to contact the office if you have problems of any kind.